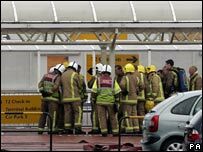 A car which was on fire has been driven at the main terminal building at Glasgow Airport. Strathclyde Police said two people had been arrested and detained in connection with the incident. The airport has been evacuated and all flights suspended following the incident at 1515 BST. Prime Minister Gordon Brown has chaired a meeting of Cobra - the emergency committee. Home Secretary Jacqui Smith said the national terrorism threat level had been raised to its highest level of "critical", meaning an attack was expected "imminently". First Minister Alex Salmond has activated emergency procedures. The accident and emergency department of the Royal Alexandra Hospital in Paisley has been closed. A spokesman for NHS Greater Glasgow and Clyde said this was due to the police investigation into the events at the airport. One of the suspects was being treated at the hospital. Emergency patients are being taken to Glasgow A&E departments at the Southern General Hospital and Western Infirmary. However, the rest of the Royal Alexandra Hospital, is operating as normal. The incident comes a day after two cars were found containing explosives in central London. The cars contained petrol, gas cylinders and nails but the devices did not detonate. 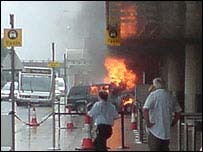 One eyewitness at Glasgow Airport said: "I heard the sound of a car's wheels spinning and smoke coming out. "I saw a Jeep Cherokee apparently as if it was trying to get right through the doors into the terminal building. "There were flames coming out from underneath then some men appeared from in amongst the flames. "The police ran over and the people started fighting with the police. I then heard what sounded like an explosion." Eye-witness Richard Gray told BBC News 24: "A green Jeep was in the middle of the doorway burning. "There was an Asian guy who was pulled out of the car by two police officers, who he was trying to fight off. They've got him on the ground. "The car didn't actually explode. There were a few pops and bangs which presumably was the petrol." Stephen Clarkson said he helped police restrain one of the men. "I managed to knock the fellow to the ground," he said. "By this time there were four policemen who got on top of him and restrained him. "His clothes had partially burned from his body. His hair was on fire. "His whole body was on fire." Thomas Conroy, a maintenance worker at the airport believes the men deliberately tried to set the car on fire. "It looked like they had Molotov cocktails with them," he said. "They sort of burst them round about the flames to make sure the car would go up big style. "Within minutes it was up and the terminal caught as well." Dr Rak Nandwani was at the airport building to pick up relatives when he saw a plume of black smoke. He said: "The whole place has come to a standstill, the terminal building has been evacuated. I have spoken to my relatives and they have been moved to outside the building. "They were told they could not pick their baggage up from the baggage collection area. "There must be about 50 police cars at the airport. Me and my son, along with everyone else, have been moved to the car rental area." Taxi driver Ian Crosby said: "This was no accident. This was a deliberate attack on Glasgow Airport." The reaction of members of the public was not to help the men in the car, but to restrain them, he told the BBC. Mr Crosby, who said he served in Northern Ireland, told how he shepherded people away from the scene in case of a secondary explosion or a nail-bomb. Two men, one of whom was reported to be badly burned, were seen being led away in handcuffs. 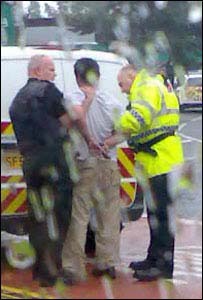 Michael McRanor from Glasgow, photographed the arrest of one of the men. A number of people are stuck on aeroplanes and on the airport strip while others have been told they might not be able to leave the airport complex until at least 2100 BST. Edinburgh Airport has been closed to vehicles which are being turned away on approach, however, flights are operating as normal.